Wig with pigtail braids and bangs. The wig features an elastic band for a comfortable and secure fit to almost any head size and is available in black or brown. 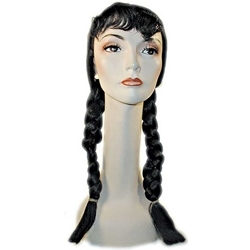 This wig can be used for a number of different characters including Native Americans, Dorothy from The Wizard of Oz, or Wednesday Addams from The Addams Family.